The telescoping thread stand is another great addition. There's also a nice stand (hidden by my giant cone of Aurifil) to really secure your cones to keep them from teetering when the thread is spooling off super fast, as is so often the case with this machine! The speed limiter is possibly my favorite upgrade on the 2010. Unlike the 98, you can now control the maximum speed of the machine, so if you have a lead foot, like I do, and maybe don't want to be stitching at lightning speed, you can control that. I never FMQ on this machine at full speed, so this is a feature that I expect to be using pretty often! I also think there's better lighting on the 2010, which is especially nice since all of my sewing these days seems to be at night! All in all, I'm super happy with the new machine. I've done a good bit of free-motioning on it so far, plus some paper piecing and some binding-making, so I feel like I've put it through its paces, and I cannot recommend this machine enough. The level of durability and sturdiness it provides and the quality of the stitches is just fantastic. I wouldn't trade it for any other machine out there! Last Thursday morning, I got the call I'd been waiting two weeks for - my Juki was ready to come home from the repair shop! Yay!! I hustled over to the shop in loads of holiday shopping traffic, not even minding the traffic a bit for once, knowing that I was on a very important errand. I brought her home, promptly set her back up in her table, and then set about to hunt through my photo collection to try to figure out where I went wrong with her. My Juki went to the shop right before Thanksgiving after I finished up a deadline project where I felt like I had to fight for every inch I finished of the project. I knew something was wrong, but I also knew I had a deadline I had to meet, so I tried to put on my best Tim Gunn to just make it work. I assumed I had a timing issue or maybe something had been knocked loose somewhere because it seemed awfully noisy. Don't get me wrong, this is a semi-industrial machine and it's pretty noisy on a good day, but something sounded different. And I was right - the needle plate was pretty badly damaged - dented and dinged as if the needle had been hitting it over and over. The damage is at the needle hole itself - you can see that portion of the plate is dented and the hole has clearly been struck many times! Yikes! The repairman added the red nail polish (NOT blood!) to draw my attention to where the damage was. As soon as they told me that, I started to wonder if this was something I did to my poor machine or if perhaps I didn't notice that kind of damage when I bought it secondhand. When I first bought it, I fully intended to bring it in for service, just to give a good once-over before I put it to use, but I couldn't help myself - I started using it, and then I couldn't stop! Brand new needle plate all ready to sew with! So, after hunting through my photos to see if perhaps I had a photo that showed me what the needle plate looked like when I first bought it, and finding photos where that needle hole is just out of focus, I've decided I needed to stop worrying about who caused the problem. What I do need to do is pay attention. If something sounds wrong, stop sewing. Take it in for service if I can't discern the problem on my own. Thankfully, I seem to have found a good repair shop, they were a pleasure to work with, but I'm hoping I won't have to see them again until it's time for a little yearly service. Now that the Juki is back, I've got a laundry list of projects, from Christmas presents to class samples and other deadlines that I've got to get cracking on. And I'm just three squares away from finishing my Christmas cross-stitch project, so I'm hoping that there will be some finishes, or at least some fun progress, to share over the next few weeks! Happy Monday to you all! A few weeks ago, I stumbled upon a Singer featherweight machine in a neat antique and consignment shop I found in my new neighborhood. A typical afternoon Florida storm was about to roll in and I left the shop without the machine, not knowing whether or not it worked and aiming to head back at some point to check it out. I wound up going back the very next day, plugging the machine in, and bringing it home when I discovered that it was still functional. I had absolutely no need for another sewing machine, but I couldn't pass up the deal. Fast forward a few weeks, and the machine sat in its' case in my sewing room closet, while I tried to unpack and get settled into the new house. I pulled the featherweight out of the closet yesterday, when I had a good friend over to sew. Olivia has a featherweight of her own and helped me tune the old girl up, give her a good oiling, fix the hand wheel, and get her into optimal running condition. Thanks to a tip from Katie, I looked up the serial to find out how old the machine is, and it looks like it was made in February of 1946, so she's going on 70! I did a bit of piecing on her yesterday, putting her through the motions and I was really pleased with how well it sewed. That is, until my husband came home. He'd been away all day, and when he came home, I asked him to help me tape up a spot on the electrical cord that was uncovered. He put his foot down, and said the cord needed to be replaced, that tape was not an acceptable fix. Being the hands on guy he is, he attempted to fix the cord himself, but when he started to open up the cord to repair it, it disintegrated in his hands. He prescribed a new cord, and thanks to Ebay, one is now on its way to me. I totally didn't need another sewing machine, but I have to say, this little sewing machine was just too cute to pass up. I love how quiet and smooth it sews, and I'm looking forward to getting it back up and running. In the meantime, I'll just admire the blocks I've put together with it so far - which are from one of the patterns I'm working on finishing up, Sew Positive. And turn on one of my other machines when I have some more time to sew ;). Have a great Monday! Today I'm participating in a fun week-long blog hop, hosted by Sew at Home Mummy and The Tilted Quilt, called Meet My Machine. If you're thinking about buying a new sewing machine, this blog hop is a perfect way for you to get up close and personal with many, many different kinds of machines and find a good fit for you. I'm excited to finally sit down and write about my new-to-me Juki TL98Q . I found this machine on Craig's List back in December, after reading for the last several years about the awesomeness that is this semi-industrial sewing machine. I bought it from the previous owner after doing a thorough test drive and falling in love with it. This machine is fast. No doubt about it. Faster than any other machine I've owned or test drove. And because of that speed, it sounds a bit noisy, perhaps a bit industrial. Very much like the machines you see on Project Runway, actually, which I don't mind a bit. The thread cutter, which is located on the foot pedal, is also a bit noisy, but I actually like that - so that I notice if I accidentally tap that part of the foot pedal! By the way, having the thread cutter on the foot pedal is positively genius. 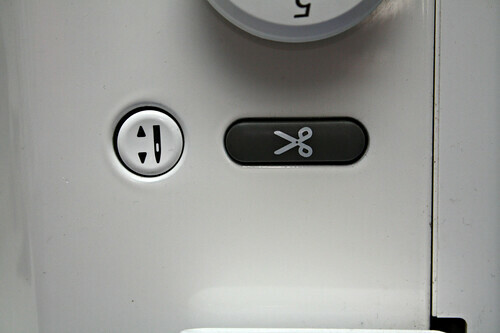 All sewing machines should have this feature! The Juki is also super sturdy. The body and exterior is die-cast aluminum, as opposed to the plastic bodied machines that we're all so used to, so it feels like it could last forever. It's a mechanical straight-stitch machine, so no fancy computerized stitches or computer to deal with. As a result, this machine does an amazing straight stitch. Even the sewing feet are metal, including the compensating 1/4" foot. Because of all of that metal, it is hefty to lug around, but it's do-able. This machine did come with a knee lift, so far, I haven't really used it. I do know that lots of Juki owners love the knee lift, it's just something I haven't tried out yet. I keep meaning to when I free-motion, and just keep forgetting to attach it. Oiling the Juki is definitely necessary, and I try to do it every day that I sew on it. Fortunately, the oil is clear and I haven't had any leakage, but I make sure to sew on a test scrap for at least a few minutes after oiling the machine, just in case. 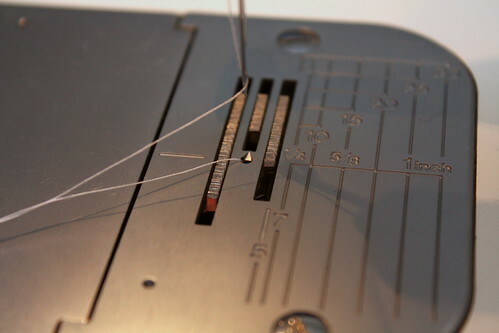 While the machine is semi-industrial, it does take standard sewing machine needles. So far, I've used mostly 90/20 Sharps and 100/16 topstitch needles (for my FMQ journey on this machine, see my post here) on it without any problems. The previous owner of the machine said that I needed to use Organ needles, but I have not found that to be true. I've used Schmetz and Klasse needles, without any trouble, and one Organ needle, which caused a great deal of thread breakage. I've also found that the machine isn't particularly picky about thread, as I've used Aurifil and Gutermann on it without issue. I prefer to piece with the Aurifil, and the machine has a shelf on the back to set large cones, so that works great for my huge Aurifil cones. Free motion quilting on this machine is beautiful. 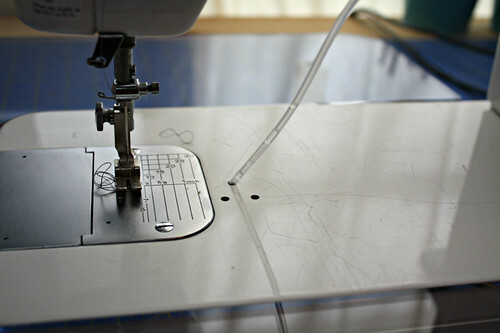 I use a Sew Steady extension table and a Topstitch 100/16 Needle and just go to town with it. The large throat space makes quilting large projects a breeze, and it's got a needle up/down feature as well so I can make sure that every time I let up on the foot pedal, the needle stops in the down position. Being a mechanical machine, the Juki is also the kind of machine that you can open and see every inch of. It even came with a repair manual! I feel confident after I clean out the lint from my Juki because I can see and get to all of the places the lint could pile up, unlike on my Husqvarna Viking Sapphire. 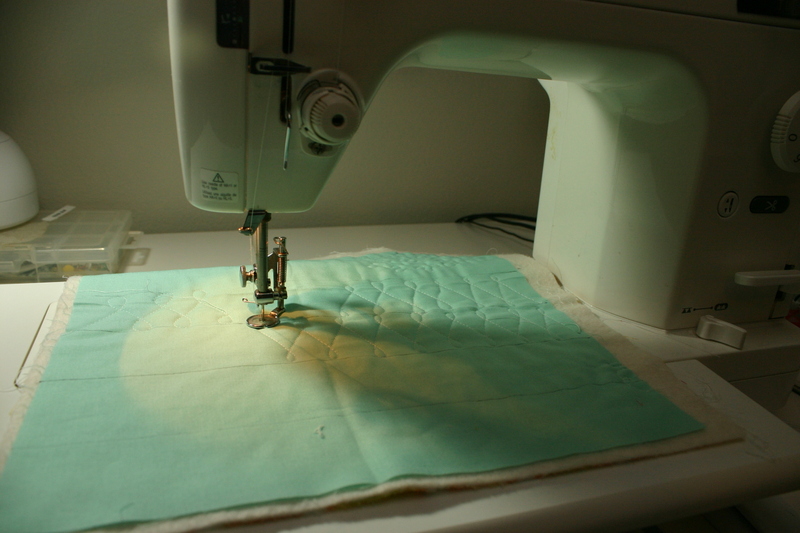 The only real con that comes to mind with this machine is the lack of light - I do wish there was more light on the machine, but that's easily fixed by adding something like Mighty Bright Sewing Machine Light , which is quite inexpensive and easy to install. I also use my OttLite Desk Lamp to add some extra light to my workspace. I'm still getting used to using a side loading bobbin, and I often have to dig out the manual to make sure I thread the bobbin properly and load it correctly. This isn't really a con, more that it's a challenge for me, since this is the first side-loading bobbin machine I've owned. It's getting easier, and I'm sure it will become old hat soon enough. For those of you who are familiar with my other machine, the Husvqvarna Viking Sapphire 835, I do still own it. 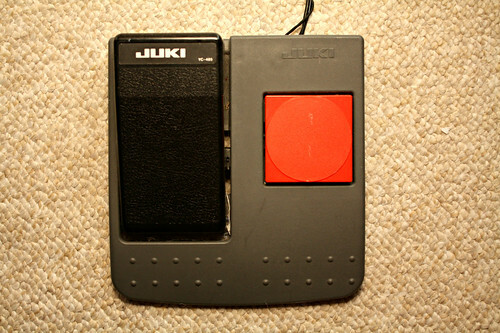 And I do still use it, from time to time, but the Juki has become my primary machine. All in all, I love my Juki. Piecing on her is easy and accurate, and if I had to do it all over again, I would definitely buy it again! I use it nearly every day, and more than that, I thoroughly enjoy sewing with it. Rachel @ Sew Happily Ever After! ...is apparently enough to turn me into a cursing sailor. I spit out quite the slew of expletives yesterday, as I attempted to use my Sapphire for some simple piecing. It was as though the top thread tension would get weird and off every 5" or 6", although the bobbin thread tension was completely unaffected. New needles, new thread, new bobbins, re-threading, de-linting, I tried a bunch of things to fix it, to no avail. Thankfully, my dealer was very supportive and has taken it in for servicing free of charge, since it just came back from a service with a clean bill of health. Hopefully it will come back to me, in one piece and functioning, shortly. In the meantime, I've been pressing and cutting like a machine, getting a couple of new projects started. One of them is a new Hip to Be Square quilt, for the pattern that I'll be releasing later this year. This quilt pattern was originally in an issue of Quiltmaker back in the beginning of 2012, and makes for a fun repeat as you put blocks together. 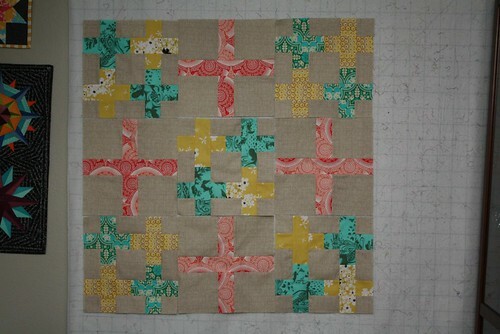 This new Hip to Be Square quilt will be featuring one of my current favorite fabric lines, Patty Young's Textured Basics. 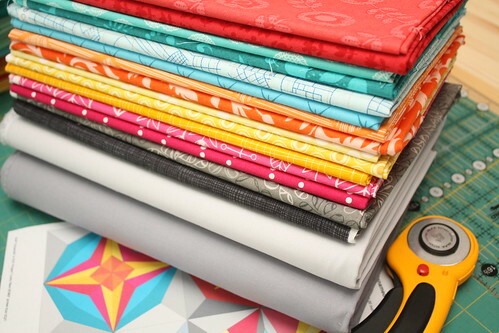 These prints are so darned vibrant and perfect for stash building! I also cut into a fun mish-mash stack of Art Gallery prints this week, whilst watching this weekend's episode of Downton Abbey. I ultimately had to put the iron and rotary cutter down and get a box of tissues. Talk about heart-wrenching! Fortunately, I had these lovely fabrics to cheer me up afterward. I've still got one more stack of fabric to cut into, but first, I need to work on oodles of Art Gallery HSTs. I've promised myself I can press and cut more fabric after I finish all 320 HSTs for this quilt I'm working on. I'm finding that more and more, I'm actually enjoying pressing and cutting, which is funny, because I used to hate that part. I wanted to just hurry up and get to the piecing, but these days, I'm enjoying having some quality time with my fabric and my iron before I cut it all up. I never really thought I'd be the kind of person who owned a bunch of different sewing machines, but I'm apparently now on that path. 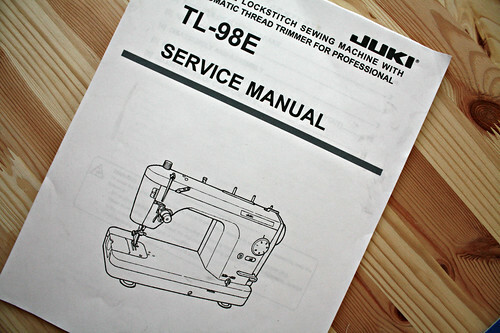 I bought my second sewing machine over the weekend, a fully mechanical industrial Juki TL-98. 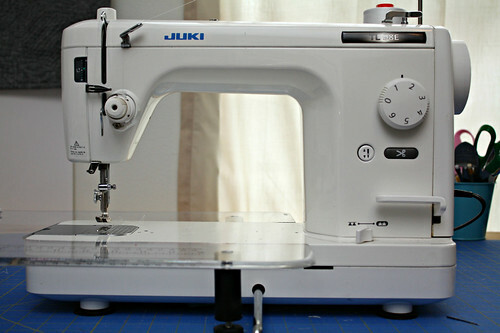 I've been half-heartedly looking for a backup machine that I could really trust, for when my Husqvarna Viking Sapphire is in the shop or for carting to guild meetings, and when I saw this Juki pop on Craig's List recently, it was hard to resist. First of all, I know of a ton of people who have this machine, or the newer edition of it, and absolutely adore it. 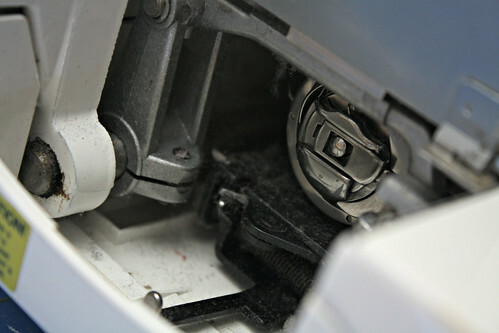 Secondly, it's not computerized, and is easy to take apart to clean and maintain at home rather than through a dealer. Thirdly, this bad boy is fast. 1500 stitches per minute, which didn't seem super crazy on paper, but in person, holy cow, it's like having one of those industrial machines on Project Runway! The speed difference was especially noticeable yesterday, as I moved back and forth between the Sapphire and the Juki, and the Sapphire is no slowpoke either. Now that I've got the Juki home, my Sapphire is on the way to the dealer next weekend for a thorough cleaning. It's only been a year since the last cleaning, which I know isn't a long time, but I can tell that there's some linty gunk that needs to get taken care of by someone who can get to every nook and cranny in the machine. Normally, I'd just take the darned thing in and live without my machine for the few days or week it takes to come back to me, but I seem to have stacked my January and February calendar with deadline after deadline, so I really can't be without a machine. Thankfully, my dealer is typically quite swift with cleanings. If you're in the Tampa area, I highly recommend them - they are the Tampa Bay Sewing Center Citrus Park office. So far, I've managed to do a bit of sewing on the Juki, but admittedly not very much. First impressions? Piecing was very easy, as was finding the sweet spot for the perfect scant 1/4" seam. 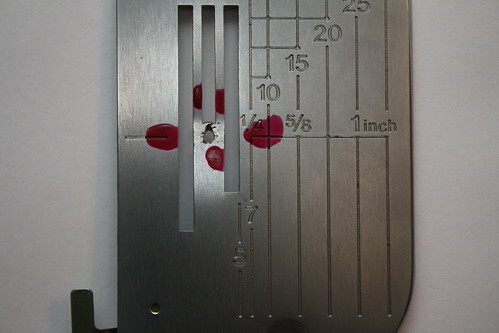 I need to do a bit of homework on the feet available for the Juki, to see if there's a 1/4" foot with a metal guide, like I have for my Sapphire, but the piecing foot that I have so far worked quite well. 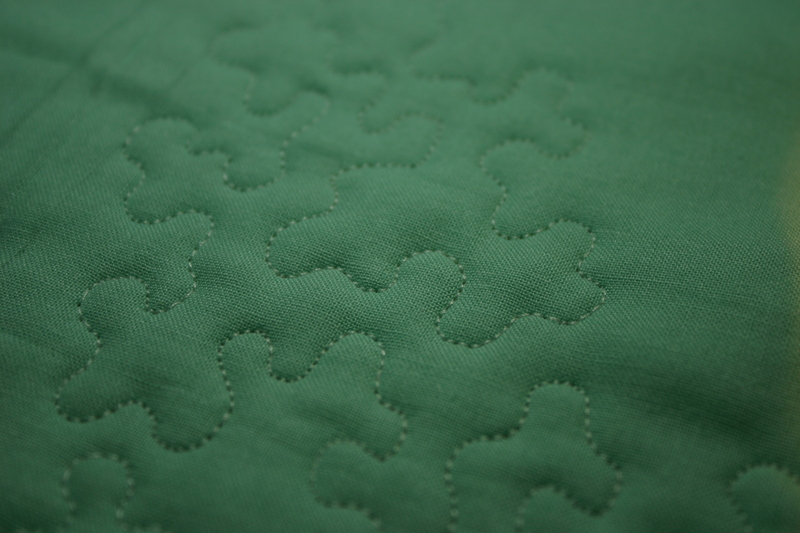 I did a little bit of FMQ, which was super smooth and required exactly zero adjusting. Not a single bit of tension adjusting, which really surprised me. Now, this machine is a straight-stitch machine only, it cannot do zigzags or anything like that, but honestly, I so rarely use that, I don't think it will be a problem for me. Today's task is going to be figure out how to thread the darned thing, wind some bobbins, and figure out how to load them, as the bobbin mechanism is super different from anything I've used before. I will definitely write more about this machine as I use it more! Wish me luck! Did you ever type up your notes from your classes? Or was that just me, the ubergeek? I always felt like I remembered things better if I typed them up. I spent six hours this past weekend getting more familiar with Betsy 2.0. I think it's no secret that I've been a little intimidated by this new machine. It's only my second sewing machine, and my first was a total entry level machine that I used as a workhorse, but never fully learned. My local dealer held a class on my new machine, a Husqvarna Viking Sapphire, over the weekend and I must say, it was definitely worth every minute. Reading the manual only gets you so far, especially for me, with this being my first computerized sewing machine and all. After sitting through this class, I feel a lot more comfortable with all of the computerized aspects of my machine not to mention all of the crazy feet it came with. I know what all the buttons mean, and better yet, I feel like I know how to use them. I think I can officially say that Betsy 2.0 and I are friends! I've learned it's an automatic sensor buttonhole foot, and I even know where to plug it in. Best of all, I used it to make my very first buttonhole. Buttonholes are so pretty when they're made in aqua thread, aren't they? I also learned that when I get nasty thread spit-up on my the back of my work it's caused by one of two things - either my top thread tension is funky (not the bobbin thread, like you would think) or I need a new needle. I made my first blind hem...well, I attempted. Definitely not perfect, but I was pleased with how it came out, and I was excited to learn the process in person. I'm not much of a hemmer, but when I told my husband that I had learned about hems, his response was, of course, "Now you can hem my suits!" The dealer attempted to teach me to use the automatic needle threader, which I never bothered to learn on my old machine, but I didn't get it. At all. It's okay, I'll stick with threading the needle manually, I don't mind. And get this - my machine has a different way of winding a bobbin that is apparently better for the tension of the bobbin...while the machine is threaded, I can actually wind a bobbin. Isn't that cool? It's apparently the best way to do it on my machine, so I'll have to remember that. Oh - and I have decorative stitches on my machine, too. That was a lot of fun to play with. I have three fonts, a block font, a Russian font, and a Japanese font. I'll have to play with the Russian and Japanese ones, I suspect they may make some cool symbols that could be pretty awesome. There are several other little titdbits that I fear I may forget if I don't type them out, so here they are, in particular order. 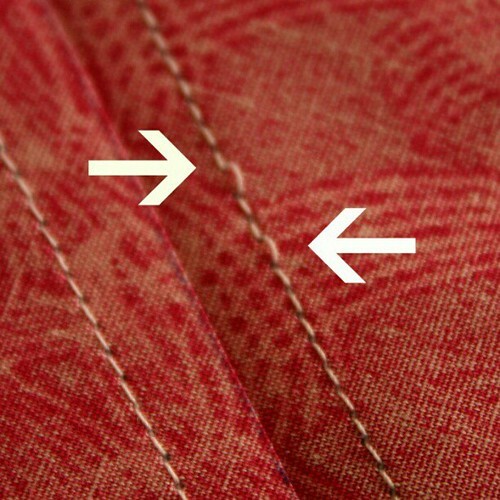 When threading the bobbin, make sure to click the bobbin thread in place. Change your needle after every full 6-8 hours of use. Mental note: change needle more often! 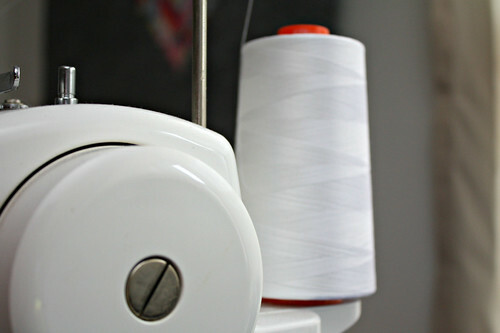 Wind your bobbin at a slow or medium speed, not high speed. There are no prizes for winding a fast bobbin! In a nutshell, that;s was how I spent my weekend. How about you? Santa, you shouldn't have...but I am so happy you did! She'll be christened Betsy II, now that Betsy I has been officially traded in for this amazing machine.